In this post, you will find all there is to know about the Software updates for Of Mice And Sand -Revised- on Nintendo Switch (originally released on December 21st 2017 in Japan, and January 11th 2018 in Europe and North America). 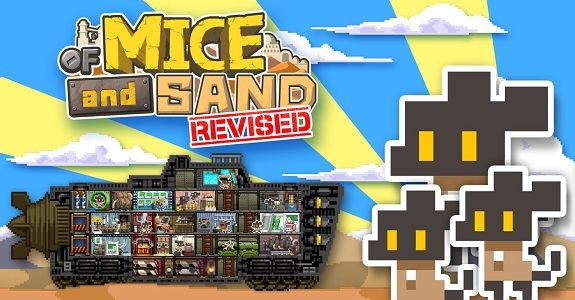 How to download updates for Of Mice And Sand -Revised- for the Nintendo Switch? Added sound test. You can access the sound test in a save data file that has seen the ending at least once through the pause screen. The task management screen now displays the number of deliverables currently on the ship. Added functionality to replace a bound mouse in a facility with a new one if the player binds another mouse in the same facility. Insufficient items in the task status screen will not display in red text. Tab positions are now saved when displaying windows. The selection cursor position in the task selection screen can now be saved. Added a button to jump to a different mouse in the mouse information screen. Added Korean language user interface. Adjusted camera speed minimum and maximum values to more closely represent their actual speeds.The game now sends a crash report whenever an error occurs. Adjusted the default sound volume. Updated information according to PEGI rating change. Fixed an issue where a portion of the texture becomes blurry. Fixed an issue where selecting the “Hospital” at certain times crashed the game. Fixed an issue that prevented the game from proceeding after choosing “Expel” and a new mouse is born immediately afterward. Fixed an issue where the pause button texture doesn’t change after pressing it. Fixed an issue where the select button doesn’t respond immediately after opening the map. Fixed the missing double quotations in the English text of rumors. Fixed other translation and spelling errors in the English language option. Fixed an issue where a mouse can be bind to the storage. Fixed an issue where the map’s camera position is not initialized when loading a saved data. Fixed an issue where the wrong item is displayed in the production item slot in the “On the Attack! !” task. Fixed an issue where the finger cursor does not display in the tutorial. Fixed an issue where the translucent effect of the laser shot from the “Rogue Droid” is not properly applied. Fixed the inaccuracy of the pop-up after choosing “do not assign” the “select” and “cancel” buttons. Adjusted the graphics of the close window button to prevent confusion due to its close resemblance to the X button. Fixed the BGM that plays near the Sand Hill Graveyard. Fixed an issue where the text messages on the bottom of the screen U.I doesn’t loop at “End Game” and instead displays a different save data. Fixed an issue where the cursor disappears at the quest screen. Fixed an issue where the required number of items is incorrectly displayed in the task selection screen. Fixed an issue where the Outpost menu button touch box was inaccurate with the visuals. Fixed unlocalized U.I in the pause screen of the Arcade. Fixed the unlocalized text message when a mouse dies. Fixed the Arcade’s ship interior graphics. Added text to indicate that there are no executable tasks in the task select screen, if such is the case. Fixed an issue where if the task “On the Attack!” is remaining after a battle is over it blocks all other tasks and a mouse gets stuck. Adjusted the left stick input feel in the list type U.I. Fixed an issue where items fall outside the ship when taking certain actions while the ship is full of items.